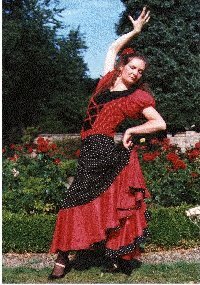 Flamenco Dance, Palmas, Compas & Fiestas. Dip. Com. Ed. Certificate of Advanced Flamenco. 21 Clermiston Crescent, Edinburgh EH4 7DY, Scotland. Carrie's classes in Glasgow have been going regularly every week for two years now. She started with the simpler flamenco forms like rumba and tangos as well as 4 types of sevillanas and fandangos de huelva. She is now teaching the more complicated 12 beat compas dances like solea, alegrias and bulerias. She has laid the groundwork for these in the Compas and Palmas courses. Certificate Baile Flamenco Avancado from Carmen del las Cuevas School in Granada. Diploma in Community Education (full time), Rambert Academy Training. 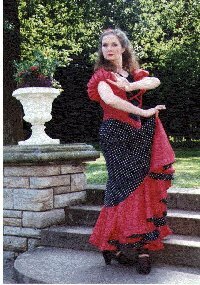 Carrie Todd: Flamenco Performances & Workshops: "Espirito del Brujo"
Original & traditional dances. Solos, duos & groups available. Musical accompaniment: live guitar or recorded tapes. A selection of authentic & non traditional costumes & accessories. Various Middle Eastern styles. Solos & group performances. Musical accompaniment: cassette tapes ~ percussion. A selection of tasteful costumes & accessories. Solo act can be adapted to suit most spaces & cafe style seating, Group requires min 10'x 10' performance space.